Made of very strong raschel knit polyethylene with a very high UV inhibitor. Available in the following sizes: Width 1.25m, 2.0m, 2.5m, 3.0m, 3.6m, (4.10', 6.56', 9.84', 11.81'). Length 20m, 25m, 50m, 150m, (65.62', 82.02', 164.04' 492.13'). Used in aiding worker safety, for paint protection, debris and small equipment containment, wind protection, sand protection, sun(UV) protection, thermal recovery assistance. Easily installed using button holes with tie wraps, and a double-knot edge for cable clips. No grommets or sub assembly required. 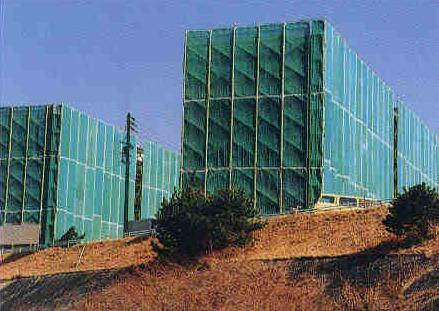 Very strong, tear-resistant, if torn damaged areas will localize and not run, contains a very high UV inhibitor, long life span, features a one way stretch feature which allows for super-tight installation, greatly reducing possibility of high wind damage and allowing for higher impact retention than similar woven material.